Energy, results, solutions, speed, activity, goals attained. The elusive Eel is a master of transformation. His surge of energy drives him to move in all directions and at great speed through the wild rivers of creativity. Highly observant, he quickly finds ways to adapt to new situations. When an opportunity presents itself, he strikes while the iron is hot. Things are starting to excel into action as you become fueled by the fertile fires of adrenaline. You’ve been making great strides. 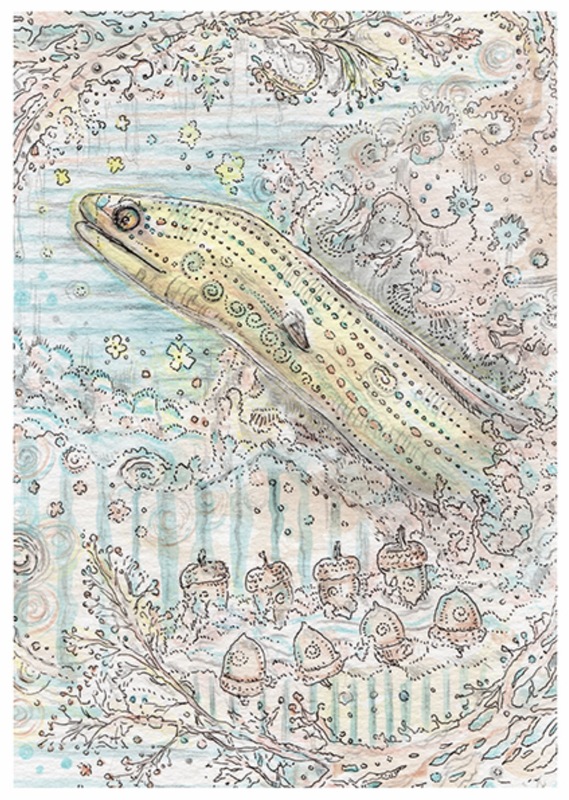 Eel will help charge you with energy as you move toward the fulfillment of your goal. Let enthusiasm lead the way, and make the most of opportunities. This entry was posted in Artist, Deck Review, Featured Card of the Day, General Tarot, Readings and tagged 8 of Acorns, Eel, Paulina Cassidy, Spiritsong, Tarot.